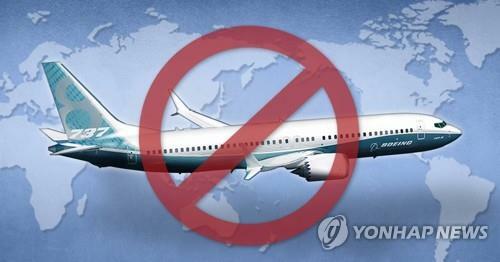 SEOUL, March 15 (Yonhap) -- South Korea joined other countries to ban all Boeing 737 Max aircraft from its airspace due to safety concerns, the transport ministry said Friday. On Thursday, the Ministry of Land, Infrastructure and Transport issued a Notice to Airmen (NOTAM) to inform pilots and airline operators of its decision to ban the Boeing aircraft from its airspace for the next three months. "The NOTAM notice will restrict any entry of Boeing 737 Max aircraft in Korean airspace until further notice from the aviation authorities," a ministry official said over the phone. On Wednesday, President Donald Trump said the U.S. will ground B737 Max jets after Europe and other countries ordered a halt to operations due to safety worries. The measures come as the same plane, operated by Ethiopian Airlines, plunged to the ground resulting in the deaths of all on board Sunday, with another flown by Indonesia's Lion Air involved in a crash in October 2018. Earlier this week, Eastar Jet said it will halt flights of its two B737 Max 8s. Other local airlines that have signed contracts to add the B737 Max 8 to their fleets said they won't operate the controversial plant until safety is assured. Korean Air Lines Co. has ordered 30 B737 Max 8 planes, with six of them scheduled to arrive this year. Jeju Air Co. has ordered 40 B737 Max 8s, with their delivery set to begin in 2022. T'way Air Co. expects four B737 Max 8s to be delivered this year. Korean Air and T'way said they won't operate the B737 Max 8 planes until all safety concerns are fully resolved. "We understand that regulatory agencies and customers have made decisions that they believe are most appropriate for their home markets. We'll continue to engage with them to ensure they have the information needed to have confidence in operating their fleets," Boeing said in a statement. "We continue to build 737 Max airplanes, while assessing how the situation, including potential capacity constraints, will impact our production system," Boeing said.